Frankfort Township would like to thank the residents of our community for their continued generosity donating to the Frankfort Township Food Pantry. With the increased demand of our clients, we are asking once again for the Frankfort Township community to continue their great support to those who are having a difficult time in this economic climate. We at the Frankfort Township Food Pantry have truly been blessed. Our community continues to provide for the needs of our residents. Our local residents, organizations, and businesses have continued to support us with food, monetary, and other donations. To the right is a picture of John Olivieri, Mokena Community Park Foundation President, presenting a $5,000.00 check for our Food Pantry. 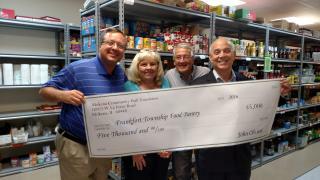 Also pictured is Jeannine Hetfleisch, Food Pantry Director, Mike Hilton, Food Harvester, and Jim Moustis, Township Supervisor. The picture below was taken in our Pantry with our volunteers helping stock the shelves.